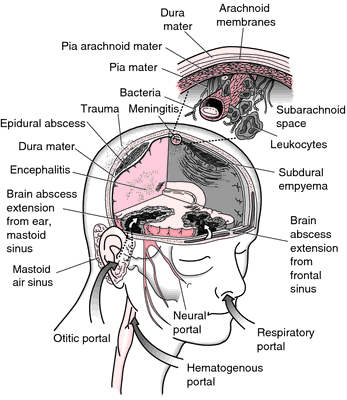 meningitis caused by various viruses, such as the coxsackieviruses, mumps virus, and the virus of lymphocytic choriomeningitis, characterized by malaise, fever, headache, nausea, cerebrospinal fluid pleocytosis (principally lymphocytic), abdominal pain, stiffness of the neck and back, and a short uncomplicated course. See also aseptic meningitis. The diagnostic efficacy of MRI in combination with cerebrospinal fluid analysis in diagnosing CNSI: The sensitivity of MRI in combination with cerebrospinal fluid analysis in diagnosing tubercular meningitis, viral meningitis and cryptococcal meningitis was higher than that in diagnosing purulent meningitis. A diagnosis of viral meningitis was once more made, at the Royal Surrey Hospital. He revealed: "For the last four weeks, I have been in and out of the hospital and have been diagnosed with viral meningitis. Therefore, several different techniques to discriminate rapidly between viral meningitis and bacterial meningitis have been evaluated. She has been supporting Meningitis Now's third Viral Meningitis Week, Vocal About Viral, to dispel myths and raise awareness about the long-term problems sufferers can face. The epidemiology of viral meningitis hospitalization in childhood. How to differentiate bacterial from viral meningitis. The recovery process from viral meningitis can be very slow, the majority of sufferers no longer experience after-effects 12 months after their illness. DANIEL STURRIDGE'S return to health, as he recovers from from viral meningitis, is a major boost as Team GB look for positives after Friday's 2-0 friendly defeat to gold medal favourites Brazil. Summary: Model and Capital Radio host Lisa Snowdon is recovering in hospital after contracting viral meningitis. Viral meningitis usually resolves in two weeks with little treatment.